Castlevania: Order of Ecclesia was released on October 21, 2008, almost two years since Portrait of Ruin. It’s the first time since Circle of the Moon that a Castlevania game doesn’t feature a Belmont either in a main or supporting role. The story also deviates from the usual “go to Castlevania and kill Dracula” bit for a majority of the game. The gameplay is also different, introducing a new glyph magic system, as opposed to using whips or other weapons. The game feels both different in gameplay and feel. The question is, are these changes for the better, or do they weigh the game down? Castlevania: Order of Ecclesia (OOE) takes place sometime in the 1800s, after Symphony of the Night, though not directly related to that game. The Belmont Clan has disappeared and several organizations had begun to develop countermeasures against Dracula’s eventual return. The most promising of these was the Order of Ecclesia which developed three glyphs called Dominus which could be used to banish Dracula once again. The Dominus Glyphs were supposed to be absorbed by the heroine of the story, Shanoa, because she was the only one who could be a vessel for these glyphs. The ritual was interrupted by Albus, Shanoa’s lifelong friend and fellow member of the order. He stole the glyphs and apparently cost Shanoa her memories and emotions. Barlowe, the leader of the order, sends Shanoa on a quest to retrieve the glyphs and bring back Albus, dead or alive. Throughout her quest, Shanoa will run into Albus numerous times and she will also meet the residents of a nearby village, who will help her by providing her with helpful items, in exchange for her assistance. Unfortunately, the characters in this game are pretty boring. Shanoa is extremely stoic and completely detached, robbing the story of emotional weight. Barlowe is also pretty boring, only providing some half useful information through the quest, for the most part. The villagers are either extremely needy or really rude towards Shanoa, which makes you want to dump them all back where you found them. If only you didn’t need their help to complete your quest. The only interesting character in the story is Albus, but you rarely see him and the exchanges between him and Shanoa are usually boring because of her lack of emotions. The story has some twists and turns, but most of them are predictable. The graphics in OOE are not really that different from the previous DS efforts. The characters are large and well animated but the quality is pretty much the same. The color palette is a bit somber, especially when compared to Portrait of Ruin’s very colorful palette. Once again, some areas have polygonal backgrounds. But, by this time, you’ve already seen it twice before. The enemy characters are just as detailed as before. There’s really not much new here. In fact, some of the enemies are actually ripped straight out of previous DS Castlevania games. There are some like Nightmare which receive redesigns and others like the Banshee which are completely new. The character portraits have been changed, for the better. 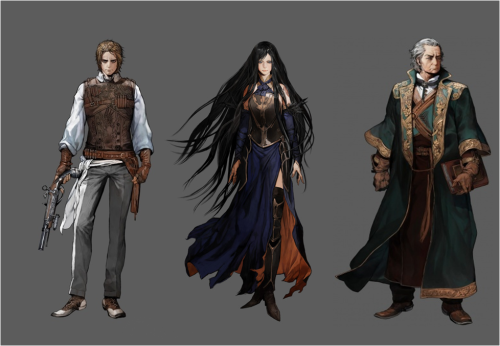 Gone are the anime style portraits from Dawn of Sorrow and Portrait of Ruin. Now we have portraits that look like the ones in Aria of Sorrow and Harmony of Dissonance. They are more serious and fit better with the tone of the story. The sound in OOE is more of the same from the previous DS Castlevanias. The voice samples, like the ones in Portait of Ruin, are in English. They sound well enough and there are plenty of them. The sound effects are also of the same quality as previous efforts. The music, however, has taken a turn for the worse. Most tracks are really boring or are just plain bad. There are three that stand out for me, however. These are Rhapsody of the Forsaken, An Empty Tome, and Jaws of a Scorched Earth. There first two are exciting and really motivate you to keep fighting, while I find the last one very soothing. OOE utilizes a new Glyph System as its new all encompassing Attack/Magic system. Shanoa is able to absorb glyphs she finds floating around, left by defeated enemies, or even stolen from live enemies. The Glyphs serve as weapons, magic, and abilities and can be assigned to either the X,Y, or R buttons. Glyphs consume MP which recover over time. When attacking with a Glyph, you can alternate between X and Y to deliver combos. If you press UP, X, and Y simulatenously, you will trigger a Glyph Union special attack which consumes hearts. Some Glyphs, such as the Magnes Glyph, allow you to reach new areas in true Metroidvania style. I prefer the systems from the previous games where you would have weapons and magic separately. In addition, there are two new attributes to the weapon glyphs that add to the confusion. These are slash and strike. Some monsters are strong/weak to slash and some to strike. So, instead of your weapon strength solely relying on how strong you are, you now also have to take into consideration these attributes. It’s especially annoying when you really like to use a type of weapon glyph but a monster is strong to it. Shanoa herself controls well. You control her similarly to the heroes from previous games. You can also press down and jump to slide, and dash backwards with the R button. You will also obtain HP/MP/Heart Max ups like in previous games, and relics which will allow you to do stuff like double jump. As for the game itself, it’s really hard. You will have to grind to move forward, especially in Hard Mode. This is the best part about the game, since every single GBA/DS Castlevania game has been easy to moderate in difficulty, except for the merciless Circle of the Moon. An interesting addition to this game is the main map. Instead of playing the game inside Castlevania as in all previous GBA/DS games, you actually travel from locale to locale by using a touchscreen map. Tap on the place you want to travel to, and off you go. It feels similar to Portrait of Ruin in that there’s a lot of variety in environments, but the method of getting there is different. A few of the locales you’ll visit. One of the places you’ll visit the most is Wygol Village. At the beginning of the game, you are tasked with rescuing the villagers that Albus has trapped inside crystals throughout the map. Once you rescue them, they will ask favors of you. 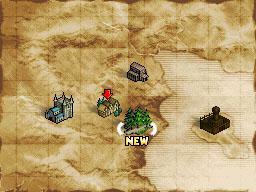 If you perform these tasks, you will obtain new items and even new inventory in the Village Shop. It’s very similar to the tasks you performed for Wind in Portrait of Ruin but dumbed down and spread out. The biggest difference is that most of the villagers are rude and or very whiny. You’ll want to put them back inside those crystals if it weren’t for the fact that you actually need to rescue them to proceed. This guy’s the worst of them all. 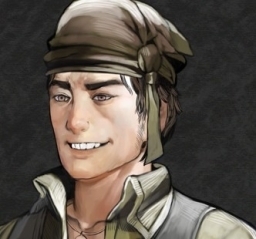 Don’t you just want to punch that smug face? OOE took me the shortest time to finish when compared to DOS (22hr:27min) and POR (25hr:55min). It may be due to the fact that you can keep your level when using New Game+. Otherwise, they are similar in length. Here's a rundown of my playtime. Boss Medals: If you defeat a boss without getting hit once, you will get a medal. They are only for bragging purposes. You can’t get them in Albus Mode. Connection Goodies: You must have both Castlevania: Order of Ecclesia (DS) and Castlevania: Judgment (Wii) in order to unlock connections goodies for both games. You can unlock Shanoa in Castlevania: Judgment by connecting the DS and Wii games. New Game+: Once you finish the game once, you’ll be able to unlock New Game+ which will allow you to start a new game with all glyphs and items from your previous run (except story glyphs). You also start at the level you ended. Sound Test: Complete the game after saving all villagers. You can listen to all the game’s music, sound effects, and voice samples. Practice Mode: Really a waste of a mode. You just go through courses as fast as you can for the best time. Albus Mode: Complete the game after saving all villagers. Albus mode is the same game as the main game but without a story. You play as Albus who has his own attacks. You can’t go into the pause menu and you can’t use glyphs. You also do not interact with villagers (lucky). You do level up, though. Fighting the Man Eater as Albus. Boss Rush Mode: Complete the game after saving all villagers. Similar to the last few games. There are two courses and they each have different rewards depending on how long it takes you to finish them. Hard Mode: Beat the game once. Enemies are quicker and deal more damage. Spikes deal more damage. There are also more enemies. Some boss attack patterns change. You can choose to start with a level 1 cap or a level 50 cap. If you beat the game using a level 1 cap, you will unlock a level 255 cap. Order of Ecclesia is my least favorite of the DS Castlevania games. I think it has the weakest story, music, characters, and gameplay. However, being the worst of an awesome trilogy is still a good thing. The game is still great, the gameplay is still tight, and the game is still fun. I still recommend this game highly, just like the last two. The word ecclesia is Latinized Greek in origin, meaning "assembly" and used in English to denote either a particular local group, or the whole body of the faithful. Ecclesia is also another name for the Catholic Church. Many of the names in Order of Ecclesia come from Latin, place and glyph names. Barlowe’s name is likely a reference to Kurt Barlowe, the vampire from Stephen King's book, Salem's Lot. Some fans have noticed that Albus shares a striking resemblance to Ffamran "Balthier" mied Bunansa from Final Fantasy XII. Interestingly enough, they have the same weapon preference. Fans speculate that Albus' theme is "Sorrow's Distortion", as the track plays during his boss battle. Due to the nature of the boss fight, he, along with a certain leader of Ecclesia, are the only bosses that cannot hurt the player by simply touching them. The Quad Ignis Kick he uses may be a direct reference to Fei Long, from Street Fighter II, who uses the same kind of kick. Keith Silverstein, Albus' English voice actor, also did the voice of Simon Belmont in Castlevania: Judgment. 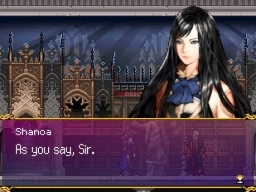 Shanoa appeared as an unlockable character in the 3D fighting game Castlevania: Judgment for the Wii. She is unlocked through a Wii-DS connection option from the game Order of Ecclesia for the Nintendo DS, or by beating the True Story with her. Her outfit is something resembling a nun's. Her theme is "An Empty Tome". Shanoa plays in the co-op game Castlevania: Harmony of Despair much as she does in Order of Ecclesia. The selection of glyphs available to her is limited, but makes her powerful. She can equip one glyph as her primary attack glyph, and up to four sub-glyphs. Magnes is her only back-glyph. Dominus is also related to Dracula's Power of Dominance that was seen in Aria of Sorrow and Dawn of Sorrow. What will the other 10 free 3DS Virtual Console be? Third a Party Amiibos: Who would you like to see? I'm disappointed you didn't enjoy this game very much. It's one of my favorites, and I personally prefer it over Portrait of Ruin. But you still gave it a really good score, while still acknowledging it's a fun game. I can see how maybe the characters seem kinda boring - Shanoa is like that per her story, and Barlowe is Barlowe. I wasn't turned off by them as much, and Albus is pretty interesting. You're crazy about the music, though. The soundtrack for this game is phenomenal. 'Ebony Wings' was pretty rockin' IMO, as is 'An Empty Tome.' But to each his own, I suppose. This was another fantastic entry in the portable Castlevania series, but I can't help shake the feeling that it's too similar to the previous games in the series. It still has wonderful music you come to expect, challenging enemy encounters, and nicely rendered art and environments, but I wonder what else can Konami do with the 2-D 'Metroidvania' series? I can see how the characters can be boring like you said in your review, but honestly Shanoa's personality or the villagers' reactions to her didn't affect my enjoyment of the game too much. Those music tracks you posted are really great. I can't remember if I would place OOE as having worse music than the other Castlevania games; they all have their moments and in general are quite enjoyable. Oh yeah, I remember one track that I really liked when I started playing the game: Ruvas Forest. It's soooo Castlevania-like. I did like the map for traveling from place to place and the variety of environments as well. I had fun playing in Albus mode, his variety of attacks make the game very interesting and different. Something else I found annoying (can't remember if this was an issue in prior games) is that even when I wanted to complete more of the villagers' requests, it seemed many of them required some material that is only dropped rarely, and even with my Treasure Hat upon my head, I was having no luck as I killed enemy after enemy trying to get that one little item drop that simply never came. 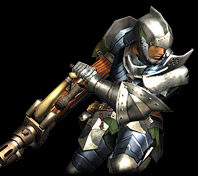 Some of the enemy designs were pretty cool like the Skeleton Rex! So Shanoa ends up fighting Dracula and vanquishing him using [Dominus], which was created using the essence of Dracula himself. Don't games like this kind of devalue the significance of the Belmont clan, in a way? No Vampire Killer whip, etc? Maybe I'm missing the bigger picture, as the stories in all the games kind of blur together in my mind. But it's still fascinating stuff, even if I don't quite understand how they're all related. So this is why Shanoa is not remembered for generations to come, despite her brave deeds. Oh, and your name tag at the end of the review looks nice! I remember back when this game was in development it was being hyped up as like some kind of amazing hybrid between the old and new Castlevania games. I'm not sure if it quite hit the high mark of expectation, but it was still pretty good. Better than Portrait of Ruin, for sure. @GameDadGrant It's a great game, I just didn't enjoy it as much when compared to the last two. I almost included Ebony Wings but, in the end, it just didn't stand out that much for me. @roykoopa64 It seems you and I had similar feelings of "been there, done that" with this game. I really did not like that Ruvas Forest, though. Albus Mode is fun, and most bosses are actually easier. There are some which will give you a really hard time though. I had a lot of trouble with Eligor. The bad thing about Albus Mode is that it's just a carbon copy of the main mode. 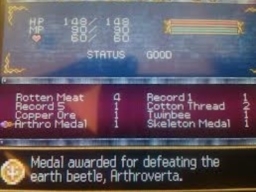 There's no different bosses like in Dawn of Sorrow, for example. I was actually expecting to fight Shanoa instead of Albus, and was disappointed when this didn't happen. Don't get me started on the ending. The whole Shanoa smiling thing made me want to shut the game off right there. It reminded me of the ending to Care Bears Movie II. And it was a lot less corny in the movie. And I'm talking about a movie with bears that have heart tattoos on their butts and shoot rainbows out of their bellies. Oh, and that name tag thing? It was inspired by your signature. I told you a while back that I was going to sign my reviews from now on. But I hadn't reviewed anything since. @Zero Thanks! I was really disappointed when I played this game the first time. I felt it was overhyped. In fact, had I reviewed it back then, it would have gotten a lower score for sure. Fortunately, I played this game with a cooler head and was able to appreciate more things this time around. Note: I edited the review a bit because I uploaded an earlier draft in which I had forgotten to post my playtime and talk about the practice mode. That's all that is new though, and it doesn't affect the score because it was considered with these things in mind. Great review as always @sirmastersepiroth. Dawn of Sorrow was my worst Castlevania of the trilogy, but they were all great games. I wonder if we'll see another Metroidvania on 3DS ever again (I see Mirror of Fate as more of an offshoot entry). I liked the game. The developers did rehash a lot of assets but that is to be expected. I will disagree that the graphics look the same. The vast majority of the game is more polished and looks significantly different than the other two DS games. It's not only the stills that have that new "gothic" look. You can see it all throughout the game. I will agree that the story is non-sensical at best but you shouldn't play these games for their story. I like the game mechanic. I thought it was a well execute marriage between the soul system of Aria/Dawn of Sorrow and the weapons of Portrait of Ruin. I also didn't think it was as difficult as some people claim it was. I thought it was a fair challenge. The first time I played it I actually thought PoR was more difficult. Maybe I've just gotten that much better with games, idk. @gencid I was thinking about that recently. I think the original timeline still has some things that can be done with it. In fact, I'm thinking of writing an editorial in which I discuss two different games for the 3DS set in the original timeline. I'm also seriously thinking about reviewing Castlevania 1-3 on the NES, Super Castlevania IV, Castlevania X, and Rondo of Blood. But these would be for next year. @Tranquilo I wasn't bothered by the environments at all. The only thing that bothered me was the muted color palette. I actually had to grind a lot in this game, not so much for POR. The game mechanic is good, but I much prefer Dawn of Sorrow's. I think DOS's is the best Castlevania mechanic to date. It's interesting how divisive the DS trilogy is when compared to the GBA trilogy where most everyone loves AOS above everything else, yet this trilogy has no clear winner. Solid review as always. I disagree in that I found the asset re-use to be less egregious in this game than most Vanias, and that the music was great, and in general it's my favorite in the franchise...but I too would struggle to rate even my least favorite Metroidvanias anything less than a 9/10. They're all just so good, the minor differences in each are bound to hit every fan differently. Nice review Sam. I'm glad you were able to get it finished, I know you said it was taking you a while to get to finish all the modes. @Earendil Luckily, New Game Plus+ helped with Hard Mode. Ouch, really? Castlevania is a series where you can COUNT on awesome music (at least the stuff I'M thinking of..way back when, NES style!). Its been a long time since I've really played one (obviously), and I've never had any handheld stuff or the PlayStation ones; do the characters move a lot quicker now? I always had a lumbering Belmont with bad knees slowly whipping things and fearing stairs. If they do indeed move quicker, and have higher agility, how does that change "Castlevania" the game? Does it make it easier? Do the enemies in turn move faster as well? Nice to see that "big bosses" are still "the thing," too!